This weekend supporters across the country are uniting in their support for the national FSF campaign to reduce ticket pricing to a fair value including £20 for away fan supporters. Aston Villa and Stoke City fans will meet outside the Holte End at 2.15pm tomorrow (Saturday 2nd October) in a show of solidarity to back this campaign. We call upon AVST members and Villa & Stoke fans to join us for the protest and show of support photo. For some time now, AVST has been concerned that fans are being priced out of the game and particularly the young. Supporters are a vital part of our football culture. Aston Villa has a great away following (as do many other teams across the country). We collectively have the best travelling fans in the world and the atmosphere we create is something that is unique to our leagues. With ticket prices at £50 plus (e.g. Chelsea), then the cost of travel, food and drink etc, you are looking at least £100 for the day. We are concerned that as a result supporters are being priced out of the game. This is why we back the FSF’s campaign and again raise the fact that Norwich’s immediate promotion back to the Premier League means each club had an unexpected financial windfall that would more than cover the cost of such action. With the bumper new television deal due to start next season, it is time that this money was used to give supporters a better deal rather ending up in the pockets of players and agents. People talk about demand and supply, but some supporters want to see their teams at whatever the cost, because to them it’s a big part of their life. Clubs constantly take advantage of such fan sentiment and the captive market it creates. That’s why they also get away with charging over £50 for a replica shirt. Some frustrated football supporters think they are powerless and say, ‘The clubs will never listen and they don’t care about supporters, so what’s the point?’. But the truth of the matter is football supporters together actually form an extremely powerful consumer group. They are the ones who pay for the tickets and the expensive Sky TV packages that the business of football is built on. Clubs and the Premier League have long banked on the tribal nature of football supporters in minimising any collective fan influence in the game, but this weekend’s coming together of all club’s fans is the first step in football fans realising the power they can have together. AVST is backing the FSF’s campaign in order that clubs recognise the contribution that away fans bring to the game and cap away tickets at £20. 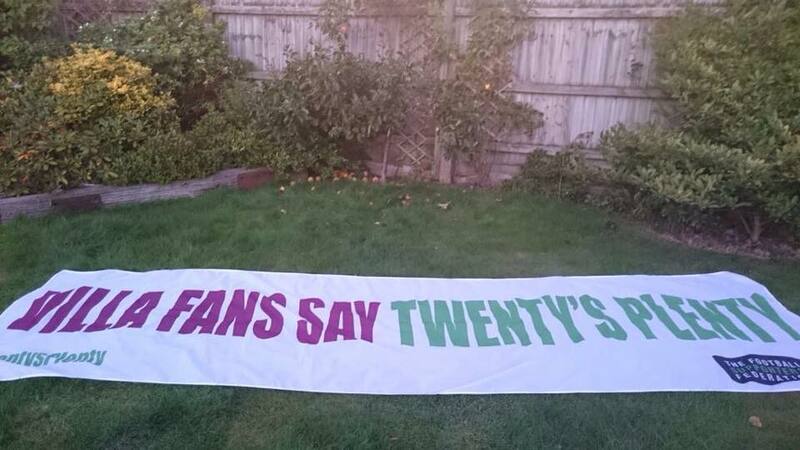 The respective “Twentys Plenty” banners for AVFC and SCFC fans will be taken into the ground in each supporters’ area. We look forward to seeing you all in support of this ticket price campaign.